Is your writing suitable for an 11-year-old to read and understand? If it isn’t, then perhaps you might want to read on. Why? Because statistics gathered from analysing the most successful 3,000 articles published on LinkedIn reveal a startling truth. The Flesch-Kincaid Reading Ease test analyses text to determine how difficult the language is to comprehend as written on a scale of 1 – 100. 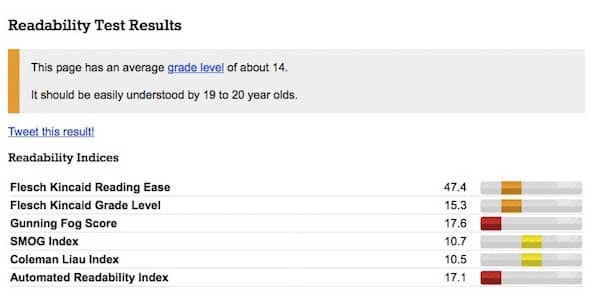 A score of 30 is considered best understood by university graduates. 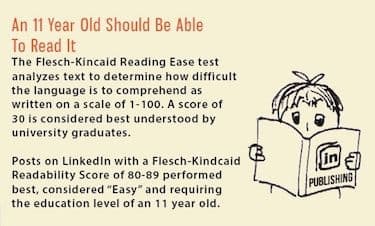 Posts on Linkedin with a Flesch-Kincaid Readability Score of 80 – 89 perform best, and requiring the education of an 11-year-old child. If this standard was being recommended for children’s, or young adult books, I could understand. But this is being suggested for 2,000-word professional articles published on LinkedIn, which really has to make one wonder. If the LinkedIn audience requires such a low level, what reading level would be recommended for Instagram or Facebook? To gain an idea of how dumbed down your writing needs to be to get a score between 80-89, try testing some of your own writing. There are many sites that offer The Flesch-Kincaid Reading Ease test, but I have used read-able.com for the following test on my most recent blog post. Not too bad, but well short of the 80 mark. Clearly, I have some dumbing down work to do on my blog posts before I can target the 11-year-old reader demographic. I next tested the first chapter of my current book, which is still work in progress. Oh boy, did I fail badly on this text? Luckily, I am not considering publishing this story on LinkedIn. So okay, all this might seem a bit silly, but it did make me wonder about ebooks and in particular their popularity with certain demographics. Do you as a writer take account of your potential reading demographic when you write a book? If you are writing vampire fantasy for example, which would probably attract teen readers, maybe it would be a good idea to check your text’s readability grade. 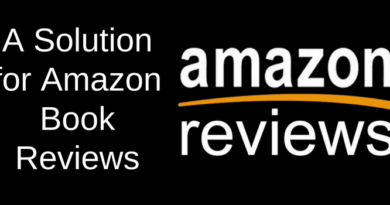 But if you are publishing self-help books for professional people, then heed the advice about LinkedIn articles, and make sure you write your book so that an 11-year-old professional can understand it! Beyond the age of 11 it is very difficult to decide reading ages a most people do not read at a higher level after that age, although, of course, university students and people exposed to literary works will develop a larger vocabulary. I believe tabloid papers are supposed to write at a level 11year olds can understand. I’m not convinced by the idea that we should write down to our readers. The best writers introduce readers to new words, rather than assuming they have to be spoon-fed with only what they know. I read books as a child that had words in them that I didn’t know. I usually just swept past them and assumed I’d understand from what else was going on. And in general I did. It’s interesting that one of the most popular ‘children’s’ series of books to come out in recent years, the Harry Potter series, don’t in the least condescend to their readers. Which is why adults enjoy them too, I suspect.